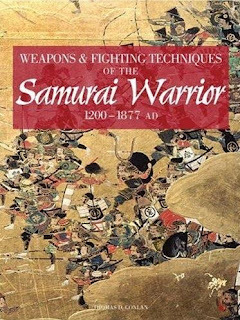 Wow, I thought to myself as I unwrapped a large parcel from a bookseller in the UK-Thomas Conlan (Associate Professor of Asian Studies at Bowdoin College and a leader in the scholarly examination of samurai warfare) has written a coffee table book-Weapons & Fighting Techniques Of The Samurai Warrior 1200-1877 AD! It's loaded with lots of color photos, diagrams, and artwork, including step by step demonstrations of fighting with bows, swords, spears, harquebus, and more. I can’t say I’m very impressed with the maps. Overall, the graphic presentation is a lot like Kure Mitsuo’s Samurai: An Illustrated History-but with more impressive writing. While I’ve only given it a quick read through (I’ll post more on it later), these are my initial impressions. As far as text goes, there is a LOT to chew on here for those interested in samurai combat and tactics. Conlan brings the same fresh perspective that he’s brought to his two former books (In Little Need of Divine Intervention and State Of War). Even those who have kept up-to-date with the newest findings among Japanese historians will find some startling new material. Conlan continues the fine work that he (along with Karl Friday) has done in exploding the old myths of samurai combat and bushido. Samurai warfare is shown to have had over 75% of its casualties caused by projectile weapons (this concept isn’t new, but more evidence is presented). The impact of the small Japanese horse on battle is examined in depth (along with the extreme reluctance of horse owners to risk them in close combat), further reinforcing the notion that there were few if any massed cavalry charges in Japanese battles, with cavalry usually only being used in close combat to go after an enemy that had broken and was in retreat. Another interesting point Conlan makes (using contemporary accounts) is that the small horses put brawny warriors at a disadvantage. Conlan also reexamines some of the more popular accounts given in most history books and puts a new spin on them. His section on Nagashino reinvents the likely course of the battle, beginning with debunking the numbers of guns fielded by the Oda. While most of us on the Samurai Archives realize that the Oda/Tokugawa forces had 1000, not 3000 (normally the number seen in Western histories), guns, Conlan takes it a step further and puts forth the notion it fielded 500 or fewer. Using the results of recent excavations of the battlefield, he postulates that Nobunaga achieved such a decisive victory by using the Tokugawa army as bait, concealing the Oda forces, and unleashing a massive ambush on the Takeda when they attempted to envelope the Tokugawa. The famous notion of ‘three ranks’ of rotating gunfire is largely discounted as an Edo period fabrication. It’s fascinating stuff many people won’t agree with, but it’s a well supported and thought out argument. Likewise, Conlan has a different viewpoint of the Uesugi army than is normally seen-he considers them to be right there with the Oda in terms of innovative and effective use of gunfire (largely due to their contact and friendly relations with the Ashikaga Shogunate, gaining access through them to early gunpowder and firearm technology) rather than the ‘traditional’ cavalry based army it is usually portrayed as. 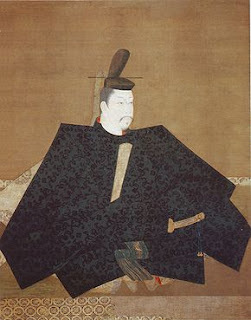 He ascribes the collapse of the major Eastern daimyo (the Takeda, Hojo, and Imagawa) largely to their failure to incorporate firearms technology quickly enough. Conlan even makes corrections to common attributions, such as identifying what is perhaps the most famous portrait of Minamoto no Yoritomo (as seen here) to be in reality a portrait of Ashikaga Tadayoshi (this info has been around since the mid-nineties, but is the first time I've seen it presented in an English language book). The book comes up short in at least one major area-being written for a more general audience, it has no footnotes or endnotes. This makes further examination or study of Conlan’s points difficult to impossible. For example, he twice brings up a female warrior, Tsuruhime, who according to oral legend fought in several battles in the inland sea around 1542 (there’s an existing suit of modified armor attributed to her). He also mentions that there is an account of a group of female cavalry that fought in western Japan in the 1350’s. I find this interesting, but a dead end-what account? Contemporary? A war tale? Temple tradition? Where do the accounts of Tsuruhime come from? Without the notes, it’s impossible to tell and evaluate these claims. Still, it’s a book that anyone with a serious interest in samurai warfare, Japanese history, or weaponry should have on their bookshelf. It will be interesting to see how the book is received by the public-the general audience it is aimed for will likely not take kindly to having its romanticized preconceptions dismantled so effectively. It’s sure to cause some spirited debate and get its readers reconsidering their positions on a multitude of topics. At around $13 for a 225 page hardcover loaded with color shots, it’s an absolute steal. Buy it today-you won’t be sorry. Thanks for posting about that book. I have always been fascinated by the history of samurai and have been looking for some good books to read about the topic. I'm sure that despite that lack of solid references on most of the points he presented, Conlan's book will help enlighten those like me who have apparently limited knowledge on the samurai weapons and fighting techniques. Its worth NOTHING without footnotes, anyone can make claims and statements with out showing what research was used as a basis for the claim.